I am avid for gentle and eco-friendly products which is why I had to dedicate this post to EcoTools of course! EcoTools just released their Makeup Brush Shampoo which literally deep cleans all of your makeup brushes by washing away all of the dirt, oil and impurities. Also, once your brushes are thoroughly clean, it actually helps with the performance of the brushes ensuring that you get a smoother and effective make-up application. EcoTools Large Powder Brush - This brush is for smoothing and evening out the skin with your powdered based make-up. It's made from soft, cruelty-free bristles and has a recycled aluminium ferrule and sleek bamboo handles - making it feel very lightweight to hold. I love how full this brush is as it helps to deliver an even dusting powder for your overall make-up. EcoTools Tapered Blush Brush - Again this brush feels super smooth and amazing! (Or let's say fluffy). this is more suited to a blush type of brush so once you sweep this onto your cheeks, you'll notice the amazing dimension it can help to bring to your overall look with the right coloured blush shade. All of the EcoTools brushes come with a reusable eco pouch which means you store your brushes in these pouches to protect your brushes whenever you are travelling. The pouch is made from natural materials and is free of PVC and phthalates. EcoTools Deluxe Fan Brush - I've never owned a fan like brush and this is actually my first so I was super excited to use it. It's made for finishing and setting your makeup, or I actually use this as the ultimate highlighter tool as it helps to highlight my cheekbones, bridge of my nose and the cupids bow of my lips. It's one of those multi-functional brushes that just adds that touch of dimension for your face. The fan brush is ideal for when you are using illuminating powders for an airbrushed finished look. This make up brush shampoo looks to address the common skin concerns by providing an all natural solution that doesn't harm the brushes and allows them to be thoroughly clean and super gentle to touch. 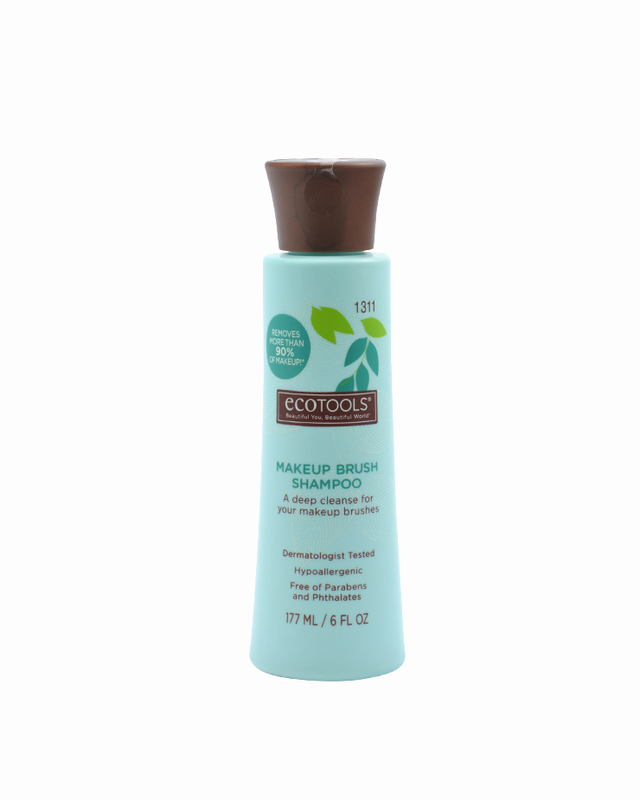 I love it when an Eco brand such as EcoTools comes up with an innovative idea such as the make up brush shampoo that can effectively clean about 90% of the make-up trapped on the brushes. The EcoTools Makeup Brush shampoo is dermatologist tested and is hypoallergenic, making it super safe to use for all skin types as it's free of the nasties i.e. parabens, etc. My brushes literally felt and looked squeaky clean after giving them a nice scrub after all of the make up being trapped in the brushes. It's highly reccomended that you wash your brushes after EACH application...but it's safe to leave the cleaning to a weekly routine. However, I would encourage you all to always wash your brushes the day after - so that you clean off all of the bad bacteria, oil, residue and other nasties that could be present on the brush. The bottle size is presented in 177ml in a groovy 'press-to-open' style lid which is so easy to use. I actually found out that it's packaged in a 40% post consumer recycled plastic bottle! (Bonus points for going green and being super environmentally friendly). How I would use the brush shampoo? Make sure you dampen the bristles first with warm water. Squeeze out excess water, make sure you always look to reshape the brush and lay it to dry flat. Don't stand the brush upright. Will you be looking to check out this Eco-friendly makeup brush shampoo? Thank you ECOTOOLS For supporting me for this review. My reviews are based on my personal and true experiences. I only recommend products that I truly support.